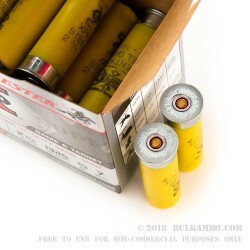 This shell contains high performance and corrosion resistant #7 steel shot. 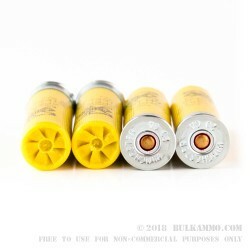 Because it meets federal and state lead free projectile regulations, you will enjoy hunting with it while neither worrying about breaking the law nor harming the delicate ecosystems where the best bird hunting is found. This shell additionally features a thicker wad segment, which conveys added protection to your shotgun’s barrel(s). It further offers a muzzle velocity of 1,325 fps, providing a well-deserved advantage in accuracy while firing upon aerial moving targets. This shell’s decent range and consistent patterns make it ideal both for upland bird hunting as well as target shooting, including trap. 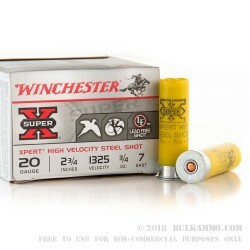 Winchester’s Super-X brand has consistently delivered high quality ammunition to hunting and target shooting enthusiasts since its introduction in 1922, and their Olin division which manufactures this shell has also provided munitions to the U.S. military for several years.